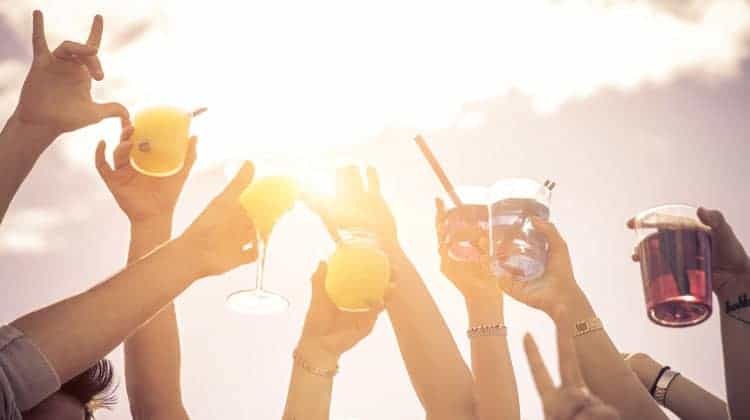 Throwing a cocktail party is one of the most impressive and fun ways to entertain and although even the word sounds glamorous, hosting a cocktail party needn’t bust the bank. Cocktail parties are an easy bet for hosts because guests don’t expect to be fed, other than a few nibbles, making them far cheaper than hosting a dinner party. At the same time, cocktail parties tend to me more memorable as well. Here’s how to throw the perfect cocktail party that your guests will love. A lot goes into throwing a cocktail party, so we created this list to help you to remember everything. Most of the ideas here take frugal approach to throwing a cocktail party so that you don’t end up breaking the bank. Decide on a theme for the event. Are you going for 1930’s Great Gatsby glamour? Or a 1960’s Austin Power vibe? Asking people to dress for the occasion will really add to the event. It needn’t be full-on fancy cocktail dress, even just feather boas and ties makes a big difference. Cocktail parties could be hideously expensive if you had to provide all the drinks yourself. Instead, decide in advance what drinks you’ll serve and ask friends to bring certain items when you invite them, so you know you’ll have enough for three or four great choices. Alternatively, just choose one cocktail and theme the night round that. If what you serve becomes your signature cocktail, so much the better. I once had a great night hosting a champagne cocktail party. It actually wasn’t very costly because of course we weren’t drinking real champagne. I detail how to make a handful of cheap drinks for your party below. You can create and send your own personalized invitations online using Evite. Doing this saves you a ton of money on supplies and stamps. Plus you don’t have to run to the store to buy the invitations in the first place. Trawl charity shops for cheap glasses. It really doesn’t matter if they don’t match. Beg, borrow and steal cocktail shakers. Remember to stock up on all the things that guests probably won’t bring but which make a cocktail party such fun. This includes paper umbrellas, cocktail cherries, olives, lemons and limes, sugar cubes and cream. You’ll need lots of ice too, which you can buy in big bags from the freezer section of most supermarkets. The right music is key. You’re probably aiming for a slightly retro vibe, which will be ruined in an instant if you just leave your iPod on shuffle and out pops Beyonce. It pays to make playlists in advance. This way you can see what music you have and what you need. If you need some music, make it a point to find the cheapest place to get it. While you might think iTunes is the best choice, if you need a handful of songs, you might find a compilation album exists with many of the songs for much less. Just remember that for the most part, easy listening is a good rule of thumb for cocktail party music. Before your guests arrive, turn your kitchen worktop into a bar, laying out glasses and ingredients, together with a few recipes. When guests arrive, show them where everything is and offer to mix their first drink. After that, it’s down to them. You’ll find that people start out very serious, diligently following the recipe for the perfect Mojito, then gradually become more free-spirited as the booze kicks in. At my last cocktail party, I discovered three people in the kitchen at midnight, none of whom had known each other before, all giggling and trying to come up with the most outlandish drinks. Being the host/hostess at a cocktail party is terrific fun. You get to wear the most glamorous costume and generally be a bit over-the-top. You also get lots of credit for organizing a great party without really doing much work at all. Now that’s what I call a result! Now that you have the basics covered for throwing the best cocktail party, we need to address the drink situation. Here are some easy, cheap drinks for you to make for the party that will surely be a hit. To make: Put the sugar cube in the bottom of the glass, then drip over two or three drops of angostura bitters and top up with fizz. Here’s how: Pour the three ingredients into a shaker together with ice-cubes, shake well and pour into a chilled cocktail glass. Add whatever fruits you wish. To make: Pour both ingredients over ice into a lowball glass. That’s it. Simple, delicious, and pretty cheap too. Make a Black Russian and top up the glass with cream for a gorgeous drink that’s as high on taste as it is on calories. What the hell, you’re having a party! To make: Fill a highball glass with ice. Pour the gin and lime juice over the ice. Top with club soda. Garnish with a lime wedge. To make: Pour the ingredients into a highball glass with ice cubes. Stir well. Garnish with the lime wedge. The Gin Tonic is a simple drink and can be the perfect base to experiment with new drinks. One common variation is to add some juice. Apple, cranberry, or orange can add a nice splash of flavor to your Gin Tonic. To make: Squeeze the juice of half a lime into a highball glass. Add ice cubes. Pour the rum and cola into the glass. Stir well. Here is one last tip for making cheap drinks for your cocktail party. If you throw cocktails parties often, or you just like sodas, you may consider investing in a soda siphon. With a few CO2 cartridges and a soda siphon, you can save you hundreds of dollars versus individual bottles of soda. Even though your guests are not expecting any food, having some appetizers would a nice touch to your cocktail party. Here are a few cheap party food ideas to make your cocktail party one to remember. Creating a salad bar can be cheap if you are willing to put some work into it. The key to a cheap salad bar is to chop the veggies yourself instead of buying them pre-chopped. Just arrange a variety of chopped vegetables on a platter, and some dipper sauce and you are good to go. Some vegetables that work pretty well on salad bars are carrots, celery, green pepper slices, grape or cherry tomatoes, cucumber slices. For the dips, you can use hummus, guacamole or ranch dips. Easy to make and an all-time favorite. Pick two or three varieties of pasta. If you can get a variety with vibrant colors like orange or green, that would add a nice touch to the pasta bar. Try to go for the small varieties, as those are easy to serve. You will also need two or three types of sauce. You can try some of the tomato-based varieties like Neapolitan or Bolognese directly from the jar. A pesto sauce with its green color would add a nice contrast as well. You can’t go wrong with bread and cheese. Find a good and cheap selection of cheese. For the bread use plain French bread or natural crackers. Crackers with flavors or seeds tend to be more expensive, and they can overwhelm the flavor of the cheeses. If you use a French baguette, slice it and serve it in a separate bowl from the cheese. Place a different knife for every type of cheese to avoid mixing the flavors when your guest’s cut it. Alternatively, you can slice the cheese before the cocktail party too. This is another cheap party food favorite of many. And the ingredients don’t cost a lot of money. When factoring in how many eggs to buy, just remember that you halve the eggs. So a carton of 18 will provide 36 deviled eggs. There you have everything you need to throw a cheap cocktail party. At the end of the day, it really comes down to the atmosphere and that is controlled by you. Be sure to make your guests feel welcomed and do your best to introduce people to others. This will certainly help break the ice and get conversations started quicker. Finally, don’t fall for the advice that you need to have games to have a great cocktail party. The truth is, many times games take away from the good times. By inviting great people and doing your part as a host, you will ensure everyone will have a great time.